I read The White Book, by the pseudonymous Robert S. Oculus III, about a year ago, when Laura Wood was promoting it on her blog (qv). Since then I’ve been working on and off on these comments and wondering whether or not to publish them. Well, here they are. Although Oculus does not develop the point, something very similar is true of American blacks. Their ancestors belonged to specific African ethnic groups, but they themselves are no longer ethnically Hausa or Fula or Igbo or Yoruba or whatever; they’re just Black. These two ethnic groups — Black and White, African-American and European-American — are the main peoples that can be called simply “American.” (Of course various indigenous tribes also qualify, but these groups are much smaller. The White:Black:Navajo ratio is 672:129:1.) The others — Mexican-Americans, Chinese-Americans, etc. — still have clear ethnic ties to non-American groups, and their hyphenated names are appropriate; but Blacks and Whites are Americans in the same simple sense that an ethnic Frenchman (as opposed to, say, a French citizen of Maghrebi origin) is French. Do these words scare you? Do you feel like a bad person just for reading them? Do you think I am evil for writing them down, or even thinking them? It’s okay if you do. You have been trained to feel that way. You have been trained not only to hate what you are, but to deny that you even exist. What is the explanation for this? Is it because we feel that the white race is uniquely evil, and that to acknowledge one’s membership in it is shameful? Or, conversely, perhaps it is because it is so good to be white — because the white peoples are among the most accomplished and “privileged” on the planet, and so to make a point of one’s whiteness is bad form, in the nature of gloating? Or perhaps the problem is simply that whites are a majority in America, so that when I say “I am White” rather than “I am American,” the people I am excluding from my in-group are more salient than those I am including; it sounds less like a statement of camaraderie (“Tom and Bob are my good buddies”) than like a mean-spirited rejection of others (“I’m friends with everyone here except Pete”). Of course, whites in white-minority areas like Los Angeles presumably aren’t supposed to identify as white either, so that can’t be the whole explanation. Perhaps in part because of his overly broad definition of “White,” Oculus struggles when it comes to describing what White culture is all about. He rejects the idea of America as a “proposition nation” defined solely by the abstract ideas laid out in the Constitution, insisting instead that any real nation must be firmly rooted in race and culture. But he then proceeds to define White culture in terms even more abstract than those he is criticizing. Whites care about order. They work hard. They respect rules. They don’t cut in line. They have a moral code. In other words, basically, “White” means “civilized.” I understand that Oculus is trying to instill a sense of White pride by focusing on objectively good things — but still, defining a culture in this way is outrageous. First of all, the idea that a culture can be defined at all, especially in terms of abstract principles, brings us right back to the “proposition nation” idea that Oculus is supposedly against. Culture is not simply an ideology; it has to be organic and particularistic. It can be, so to speak, motherhood and apple pie, (i.e. abstract principles plus historically contingent features), but just motherhood isn’t enough. A more serious problem is that the things Oculus identifies as “White” — order and fair play and so on — are universal goods to which every race and culture ought to aspire (though of course not every group will be equally successful in so doing). When Oculus identifies White culture simply with being civilized, his implied message to non-Whites is that not being civilized is an essential part of their culture — which they should presumably cherish and protect as much as Whites should theirs. Oculus’s treatment of the issue of racial segregation versus integration is also, I think, naïve. His basic position is that if freedom of association is restored — that is, if people are given the freedom to hire, do business with, and associate with whomever they choose — then the resegregation of America will happen naturally because that’s what most people of all races really want. Whites like to associate with other Whites, Blacks with other Blacks, Chinese with other Chinese, and so on; simply allow them to do so, and our problems will be solved. But that’s obviously not true. Under the current system, no one is forcing Blacks to move into White neighborhoods (or Mexicans to move into America, Chinese to go to WASP schools, etc. ), but they do it anyway — probably because White neighborhoods and countries and schools are so often the “good” neighborhoods and countries and schools. The “freedom” Oculus is advocating is essentially the freedom of Whites to keep out Blacks (and others) who want to move in — so by definition it does not result in “what everyone wants.” In fact, freedom of association is not such a clear-cut concept. If A want to join B’s club (company, school, neighborhood, country, etc.) but B doesn’t want him to join, whose “freedom of association” should the law protect? I’d say B’s, because it’s his club, and I’m sure Oculus would agree — but we shouldn’t pretend that such a policy is giving A what he wants. It’s a hard fact to face, but the truth is that segregation is good for Whites and integration is good for Blacks — and the law must support the one or the other. Either it supports segregation by saying I have a right to keep you out of my club even if you want to join, or it supports integration by saying you have a right to join even if I want to keep you out. No neutral policy is possible — and therefore, since Blacks who want to join White-run “clubs” vastly outnumber Whites who want to join Black-run clubs, no racially neutral policy is possible. Any policy adopted will be, de facto, either pro-White or pro-Black. Disparate impact of one kind or another is unavoidable. Now no one on either side wants to hear that. Having been indoctrinated into the idea that “racism” is the worst possible evil, no one wants to admit that their preferred policy amounts to favoring the interests of Race X over those of Race Y — but that is nevertheless the way it is, and honest people have to come to grips with it. Closely related to the idea of segregation is that of the “ethnostate,” which Oculus supports. His main interest is naturally in pushing for the creation of a White ethnostate in America, but he welcomes other races to do the same. I should make it clear that Oculus’s idea of an ethnostate is not that of a monoracial state where other races are not welcome. Rather, his model ethnostate is Israel — including several different racial and religious groups, but existing for the purpose of serving the interests of one of them. Non-Whites and non-Christians would be welcome in his imagined White ethnostate, but they would have to accept that the state’s policies would be calculated to favor White Christian interests over those of other races and religions — as opposed to the current policies of the United States, which, under the guise of an impossible “neutrality,” serve the interests of racial minorities and the irreligious at the expense of those of White Christians. It’s easy to criticize Oculus’s various proposals, but more important than any of the solutions he proposes is the problem he recognizes. To repeat, “Say it out loud: ‘I am a human being, but I am not just any human being. I am a white person. I am a member of the white race.’ Can’t do it, can you?” So long as we can’t do that — so long as we feel vaguely “evil” for even reading those words — we have a serious problem. Your race is your extended family; loving your race is loving your family; disowning it, ditto. Determining what actions and policies should follow from those principles is a difficult business, but the principles themselves are irreproachable. Me all my days until I die. Then in God’s house I’ll dwell for aye. Notice anything strange about that picture? Why is a horse burning in hell? Because this wasn’t originally meant to be a picture of hell at all. It’s Johann Georg Trautmann’s painting View of the Burning Troy. You will search Dante in vain for anything resembling this scene. But it shows “an inferno” — a conflagration — and was thus deemed appropriate. 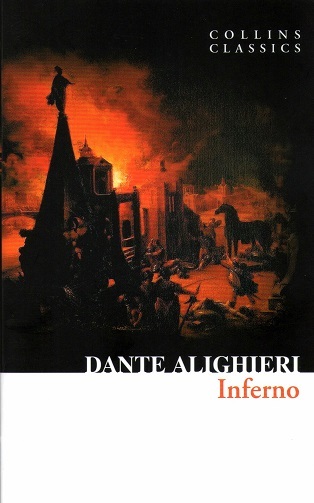 My theory is that English-speakers are subconsciously influenced by the phonetic resemblance of inferno to furnace, with perhaps echoes of fire, burn, and incinerate as well.